Following 15 years of coaching and training seasoned leaders I was, at first, intrigued how often confidence surfaced as an area for development. In spite of the knowledge, skill and experience, these capable high performers were holding themselves back unnecessarily. What was particularly interesting is that this was as true of people who seemed to exude confidence as it was of people who clearly lacked confidence. The bottom line is that we all have a stretch zone – and confidence is an issue for EVERYONE who has the courage to step outside their comfort zone. Anyone can be confident in their comfort zone – but it never really matters. When it matters we find ourselves under the increased pressure of the stretch zone – and our confidence so often disappears when we need it most – and we hold ourselves back for no reason at all. What is confidence? How does it work? Where does it come from? How can we be so confident in some situations and lack confidence in others? What makes it appear and disappear? Where does it appear from and where does it disappear to? How can we be confident anywhere, anytime? Arising out of these questions is The Stretch Zone, my first book, which introduces a whole new way of thinking, challenging outdated assumptions and turning our understanding of confidence completely on its head. The Stretch Zone is about releasing potential – when it really matters. The Stretch Zone is unique as it does not go down the well worn path of confidence boosting hype, wasting effort and energy. Instead it inspires us to channel our efforts and energy to where they matter most – releasing authentic confidence from within – anywhere, anytime. The secret to unlocking potential resides within oneself. When it really matters what holds us back most is none other than ourselves. While skill, knowledge and experience are critical, confidence is the differentiating factor that enables our best when it really matters. A common concern is that confidence is limited to only certain types of personality. So people frequently hold themselves back, believing they just haven’t got it. This is a fundamental mistake. Confidence is an imminent potential for EVERYONE regardless of personality, it just looks and sounds different – and difference does not mean absence. 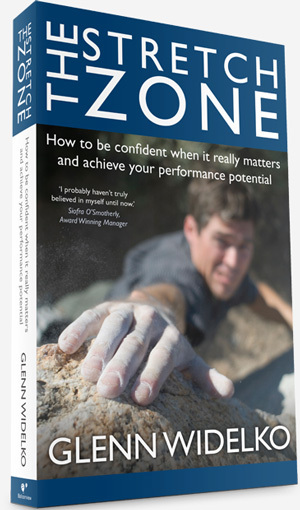 Then The Stretch Zone will enable you to unlock your potential – when it really matters!